My 2016 row by row from Alewives Fabrics in Damariscotta, ME is finally done! I had the top done at the end of June and really thought I would have quilted it sooner, but it took awhile. I love to go to Alewives Fabrics. Rhea and her crew have great fabrics, samples and patterns. They are quite busy in the summer season but her enthusiasm carries throughout the year! Rhea worked at Cambridge Quilts (where I also worked) when she was attending school in Boston. Her design and color sense are always spot on! I really enjoyed quilting this. For the sky and grass/hills, a wavy line. This shows you a close up of the binding. 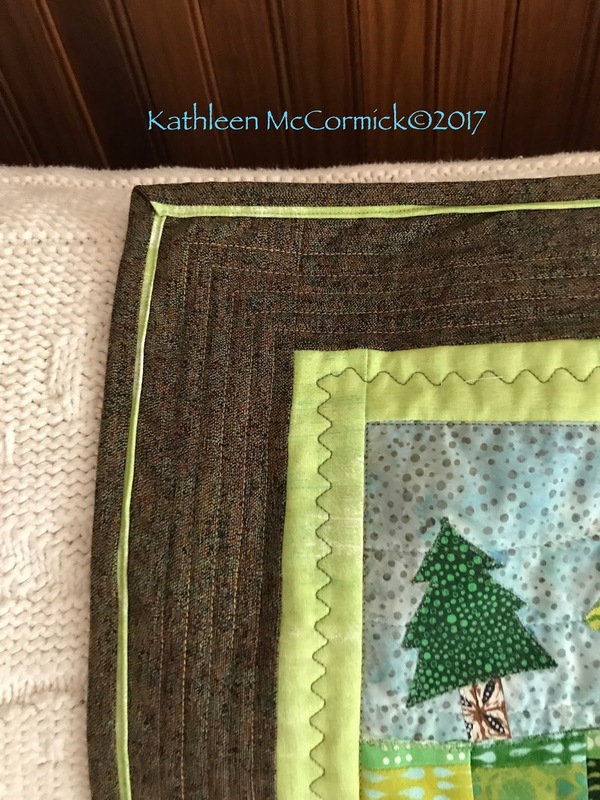 I used a method I have used before and really like it from Sew Fresh Quilts. My only problem was I was really close on fabric and kept praying it would work – measuring it out was not an assurance that turning those corners would make it. In the end, I had about 6″ of binding left – a little too close for my liking! It’s a simple table runner and I’ll use it in my Maine cottage. I was thinking of hanging it over one of the doors in the upstairs, but I might need 4 to do that, so I will think about that and what I have left of other row by rows OR repeat one. In the next week or so, I’ll regroup on my UFOs. First, I must register two quilts for our guild in the fall (and finish one of them). I am really slowed up with the move, and my primary sewing study is a disaster. My goal is to have room to sew by Labor Day weekend. Next Post Pets on Quilts 2017! The binding ties it all together so beautifully. I am glad you had just enough! Thanks, Yvonne. It really is a nice technique for smaller things. Thanks, Andrea! I am very pleased with the way it turned out. If it were only an organizing project – moved from a large house to a 3 bedroom apartment! We still have our cottage in Maine but I have much less space and am short a desk at the moment!! Soon it will be better; to ease the stree we go to Maine every few days and then return and tackle a new piece! 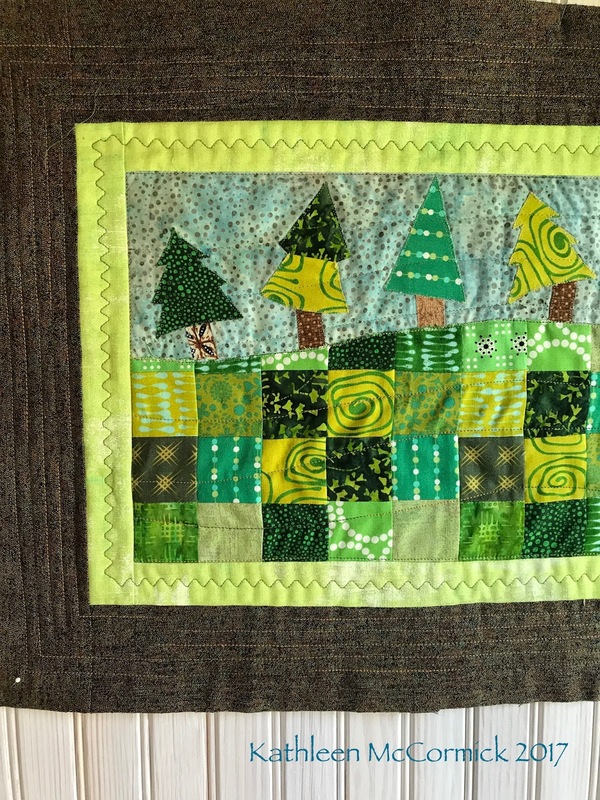 This quilt just makes me smile–I love this quilt with all of the greens, such a sweet pattern. Nice finish with the quilting and the binding and I wouldn't call it a simple table runner–it's wall worthy. Thanks, Rose. I have the same reactions. I think its the greens (more yellow than my usual choices) and the Dr. Seuss-like trees! Okay, Alewives is on my list of places to visit! I love the quilt; the fabrics are really fun as well as the design. The flanged binding adds a fun pop too! You'll love Alewives. Your packet of 48hrs in a few towns is on its way to Northfield. My husbands Uncle started the Stanton airfield there and my husband took some flying lessons their in his youth! Small world….his mother was Malcolm Manuel's sister. I did meet Margaret twice, early in our marriage. She was quite something too! Love how you took one row and made it into a table runner. Thank you, Abbie. It was a fun row by row quilt to do!